"Wait...what country is this again?" Irish singer-songwriter Chris de Burgh said on Wednesday that he had realized a lifelong dream by visiting Iran, expressing hope he would be the first Western pop star to perform in the Islamic republic since the 1979 revolution. The 59-year-old arrived in Tehran on Tuesday to examine the possibility of holding a series of concerts this autumn for Iranians, who are among his most faithful fans. "I can't tell you what a great pleasure it is to be here. This has been my dream since I was a little boy," the clearly delighted singer told a conference packed with domestic and foreign journalists in the Iranian capital. De Burgh has been invited by the Taraneh Sharghi music production company, whose leading pop band, Arian, has recorded a song called The Words I Love You with de Burgh in a mix of English and Persian. 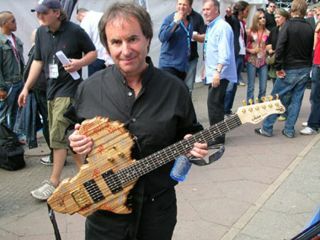 De Burgh said he was aware of the restrictions imposed on performing arts in Iran but insisted that he was determined to play concerts to "make a difference." "I am not politically naive and I don't believe everything I read in the media," he said, adding that friends and family had raised eyebrows at his plans of visiting Iran and tried to talk him out of it. "I say to them what are you doing to make a difference?" he said, insisting he was there for ordinary people "just as I went to Lebanon after the civil war" between 1975 to 1990. "I do not want to make snap judgements. I know some things are forbidden, like alcohol, but I don't have a problem with that." Taraneh Sharghi manager Mohsen Rajabpour expressed hope that the concerts, including at least one in Tehran, would go ahead in October or November this year, saying he had already obtained oral permission.